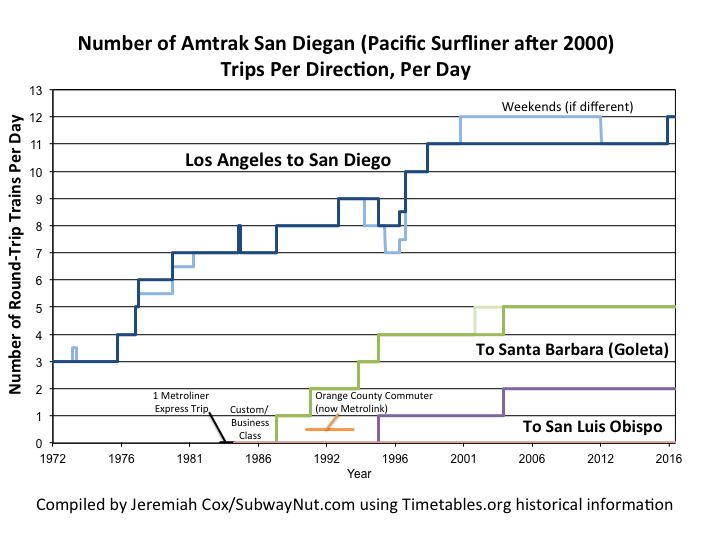 Amtrak's Pacific Surfliner's is the busiest corridor except for the Northeast Regional. Trains operate 12 times per day between San Diego and Los Angeles with five trains (one early morning train originates in Los Angeles) leaving Los Angeles in the reverse direction (the station is stub-ended) to run north to Goleta and two of these trips extended to San Luis Obispo. Connecting thruway bus service is available up the Central Coast to and from San Jose and Oakland connecting Pacific Surfliner trains with Capital Corridor trains. Trains are all Unreserved (except around Thanksgiving and a few high-ridership summer weekends) although Reserved Pacific Coast Business Class is available. Business Class includes complimentary muffins, cinnamon rolls, juice and coffee on morning trips with snack packs and a beverage (including a complimentary wine option) on afternoon and evening trips. Metropolitan Lounge access in Los Angeles is also included. Bicycles can be brought on-board (stored on the lower-level of the coaches) but since 2013 have required a special free bike reservation ticket. The Rail2Rail (launched in 2002) program allows Metrolink Monthly ticket holders to ride Pacific Surfliners free of charge within the destinations of their tickets. Since 2013 three off-peak trains between Oceanside and San Diego are contracted by NCTD to supplement Coaster service. These trains make all Coaster stops and accept all Coaster tickets (including regular one-way and round-trip tickets). Amtrak tickets can be purchased directly to all Coaster stations. All Pacific Surfliner trains are push-pull trains. Except for one trainset use double-decker Amtrak Surfliner Cars purchased between1997 and 2003. These cars are the second-generation of the California cars used by the Capital Corridor and San Joaquin with more comfortable reclining seats. In addition a few normal Superliners also supplement service. Food service is provided by a cafe area located in the lower-level of one of the coaches, not an entirely separate lounge car like the California cars. Pacific Business Class is its own separate car with both upper and lower-level seating. The seats are the same, there is just more legroom and small buffets for food. Power is normally provided (supplemented by normal Amtrak P42s) by unique F59PHIs in a unique Pacific Surfliner paint scheme. A car shortage and extension of an additional trip to San Luis Obispo since 2004 means one trainset uses older single-level Amfleet and Horizon Cars. This train generally uses a mix and is push-pull using a P42 at one end and a ex-F40 Cabbage Car at the other end. History: The Pacific Surfliner is the only one of the three corridors in California to be continuously operated by Amtrak. Until June 1, 2000 as part of the rebranding to Pacific Surfliner trains were known as the San Diegans. Under the start of Amtrak non-state subsidized base service operated between Los Angeles and San Diego three times per day (one of these trains in the early years was the extended Coast Starlight/Daylight south to San Diego). In 1976 the State of California began subsidizing one round-trip and service has been increased ever since. Service north of Los Angeles (supplementing the Coast Starlight that has operated continuously) began in 1988 and all the way to San Luis Obispo since 1995. The weekends with half-trips indicate a train operating one-day (such as Sundays) only. From April 29, 1984 until April 1985 Amtrak operated one round-trip per day as a limited, all reserved San Diegan Metroliner Service. This premium service included "In the morning enjoy a complimentary newspaper and continental breakfast, evening sample tasty snacks and hors d'overs" (October 1984 trip report riding the first Metroliner trip, with roast beef finger sandwiches and unlimited cocktails). This service was discontinued but became San Diegan custom class service that is today's Pacific Coast Business Class. The extension of a San Diegan to Santa Barbara was delayed until Amtrak could specially bring a locomotive (predecessor of a Cabbage Car) and coaches for push-pull service. The siding in Goleta (originally just a couple sidings, later turned into a station stop) lacks a wye for turning non push-pull trains.